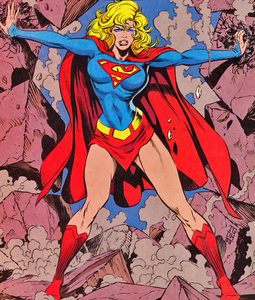 Supergirl and Powergirl actually share the same genetics... they are merely alternate dimensional (universe) versions of each other. I really like the debate on who is better suited to wield superwpower, but since it was kind of off-topic I moved it to its own brand new thread (I hope you don't mind). Given they come from a planet that has no lakes or oceans, it's not surprising that Vels prefer beaches and water when on Earth. And given that it takes a close encounter with a high-yield nuke to give them a sunburn, their preferred beach wardrobe is simplicity itself, as this picture shows. And sand in all the wrong places is a good thing when you're invulnerable. The ability to one-hand a railroad locomotive over their head on our planet is a real confidence builder. Those muscles aren't just for show. Last edit: 01 May 2017 18:59 by shadar. A graphic example of why disguises work. The exotic costume, the flying, the powers. Goddess stuff. Add in two different personalities, one demure and shy as Linda and the other outgoing and demonstrative as Supergirl, and it really is possible to live two lives, even among the same people. Last edit: 04 May 2017 11:22 by shadar. I had a jawhitsfloor moment when I saw that Flash costume! 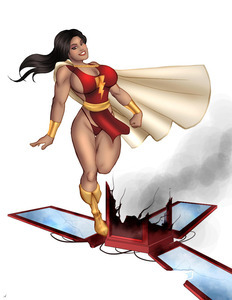 Is that AZ Power Girl in another costume? Last edit: 05 May 2017 22:01 by Agent00Soul. Agent00Soul wrote: I had a jawhitsfloor moment when I saw that Flash costume! Is that AZ Power Girl in another costume? No, that's Marie-Claude Bourbonnais a French Candian model, designer and cosplayer. Last edit: 05 May 2017 22:37 by Woodclaw.